Whats happeing to this country? Had one of those days I want to hang decorations from my dangly bits and dance around in the rain! One of the research projects which started off so fast this month came to a halt the Friday before last. I had to come up with my own depth sorting hider algorithm. I couldn't stop my other duties so I had to stop production on the short I am producing. I was up most nights last week trying to figure this problem out. Probably easy for you smart guys but I was strapped for time and cannot afford lost days. Thankfully today was the breakthrough I needed, looks a bit rough but nothing filtering won't fix. Looks like tonight my mind will finally get some rest, and I might get a decent sleep. Tomorrow some code cleaning then Wednesday back to what I love - animating. Learnt a lot in the process so it was all worth it. This Saturday and Sunday I spent over the georgeous Keio Hiyoshi campus. We were hooked up to Pixar in San Francisco via Polycom HD. Because Siggraph Asia has not yet gone public. I will wait to put any photos up showing any more detail than this setup shot before the meeting started. It was great to be a part of the inner workings of the largest conference in our industry. To see the dedication to fairness was probably the biggest highlight. Regarding Wednesdays TokyoGAF party in Shibuya. There seems to be some confusion, some people might think they have　a RSVP for Wednesdays night event but haven't properly booked yet. Just joining the TokyoGAF site does not mean you have a RSVP for the party. No problem you have a RSVP and will be having a cool night out with us! By tonight(Monday) after 6pm I have to go around to the club and pay a registration fee for EXACT numbers, so there can be NO maybes by 6pm tonight(Monday). Please change it to "attend" or "not attend" before 6pm Today (Monday). A maybe will be considered NOT registered, and you might not be able to enter! After 3 meetings and 2 events on Friday by night I just wanted to sleep. My friends brother who is a popular photographer here Benjamin Parks was having his photography displayed at the Naked Tokyo http://www.nakedtokyo.com exhibit in Super Deluxe. Well if you know me those 2 words Naked and Tokyo are just magnetic so I just had to attend. Tokyo is the ultimate in stress and naked is the release, what a wonderful combo. Of course many artists contributed to this wonderfull event. One of the best collab spaces I have seen in ages. Funny thing is I found out I DONT like art in a club space. I want to mull over pieces, which is hard when people are partying. I'm a party guy but not when it comes to art. Enough fun and naked Japanese bodies for a night, I just realized Tony mailed me the resources I need for tomorrows judging. Going back to the office for a printfest. Man just realized I didn't even get naked! The Industrial VR conference is one of those events I try to attend each year if time permits. Last year I didn't get to see much so this year I was determined to go. It's been a busy week so I can only make it to Friday afternoon, for a max of 1 hour. Met Chiyama, Tanaka, Hiramitsu, Hiramatsu, and the guys from SGI not bad in the space of 30 min. 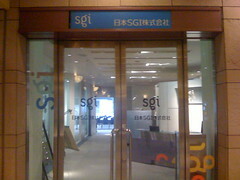 Silicon Graphics Japan and Solnet. Had a quick coffee in the VIP room with VIP Tanaka san. Unfortunately no lap dances in this VIP room so I left. Going over daily blog graph for new visitors (no not you regular folks! ), its pretty obvious new INTERESTING blogs attracts traffic much more than twitter / microblog. So? blog more & twitter less. A fairly common occurance in Tokyo is to the the totally out salarymen. Usually neckties 'round the head mean a social gathering while sights like this jus mean plain pooped. You can see there is no evidence of peer or self defamation (inside out clothes etc.). This guy later decided to put his feet up! Odakyu line 10:30pm which is fairly early to be wrecked. Dropped by sushi on the way home, love my Sunday night sushi. It's been a while since I have had a Sunday off to go to Kendo so this mornings training was a little hard on the body. Came back to the house to find Lucky my ferret in his usual unconscious state. I swear this guy must have a stash hidden somewhere he's only conscious 4 hours a day. Oh and as usual with his tongue out. Quite handy if you are busy on the laptop. After playing with 'stoner' Lucky went for a cruise to the library. Picked up some books and went to Afternoon Tea. Yesterday I was over at Silicon Graphics Japan. I was in a meeting about some of my future projects which include physics acceleration and what I have coined "assisted traditional rendering" using parallel computing and GPU computing like Cuda, OpenCL and my favorite cyberprophet Kurzweil came to mind. For those not familiar Kurzweil he is our generations Edison, an avid thinker inventor and all round likable nut. I mean that in a nicest possible way. If you are not a bit of a nut your just doomed to think like the rest of the herd so Kurzweil is probably my favorite nut after Dr. Nakamatsu of course, who is considerably more nuttier. Anyway back to the conversation, while talking about GPU and personal supercomputers I realized we were really talking about Kurzweil's "Law of Accelerating Returns". Just like the transistors of old, our current CPU technology is hitting that brick wall of too few electrons per cell. Very soon your new OS will have GPU computing at their cores, both Win7 and Snow Leopard have planned for it. I don't think Kurzweil's sixth paradigm is here just yet, but this manipulation of the physical limits of CPU computing by adding more and more cores with GPU super computing shows we are getting close to massively parallel computing. This will definitely make paving the way to the sixth paradigm massively parallel computing in three dimensions a smoother and easier transition. By smooth I mean a curve which keeps on increasing at an exponential rate (thanks Julien for the comment). A side note: just before the meeting a funny thing happened while having an egg Benugo and a triple shot cappuccino at Benugo in Garden place Ebisu. I had almost finished the muffin, 3 thieves came along and ate the last of my breakfast. For some strange reason animals don't find find me imposing. I have had this happen so many times, its sort of funny but why? It's like tiny animals are going "yeah yeah its just Bernie guys lets nick his brekky!" I'm about to start meeting with California again, till last week have been using either Polycom SD, Skype or Citrix, tonight using MS Live meeting for the first time, next week I will be hooked up to Pixar via Polycom High Def. It's great to be able to try out all these systems, I'm gonna blog next week and give you my opinion so far. Telepresence has really come a long way in the last few years. I'm really grateful for the time saving and the lack of freaking jet lag (YAY!) which as I get older, and the topics harder becomes a real constraint. If anyone out there can recommend something better comment away! Thanks to good design I am on schedule. I actually designed my office (rename Tardis) on THX 1138 so I would work harder and without distractions like color, design, time, you know things like everyday life. It worked I was not distracted by time at all. It shows what sensory deprivation will do to you when in an all white office. The good thing is yes it is Wednesday and I can calm down .... for at least an hour while I'm hooked up to California (PDT to you ;). PS can anyone recommend a watch for a guy like me who works in about 4 timezones a day? An intense weekend, I had another great party over Shirogumi's studio. We were celebrating Mami's Birthday, and ended up at Gokigenya, a great live place nearby. I then made my way home by taxi with Shirogumi's staff. After a little nap I was a little worn out (trans: hungover) for Sunday morning's 9am meeting. After a couple of shots of espresso around eleven I started to gain a little clarity. Some may be aware that I am a fan of Korean food and my office is near an area of Tokyo famous for Korean food. Well I was told about a great Korean Sundobu chain at Machida called (東京純豆腐 )Tokyo Sundubu. Sundubu(순두부) is a SPICY Korean tofu hotpot and it's really addictive. Whenever I am in California I look out for the BCD Tofu house or the many others dotted around Silicon valley. Pretty awesome! I had the butter version which I couldn't get near Okubo or Korea. Later I took Lucky to the vet for his shots, here's a shot of him mucking around on the passenger floor of my car. I was given some pills for him to take. So simple to dupe this ferret by cunningly inserting a pill into one in his favorite snacks a natural raisin. Popped that baby like a raver! 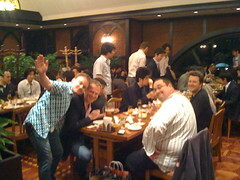 After RenderSan almost everyone had a good booze up over at the beer hall in the lovely "Ebisu Beer Station". 45 attended which was a little less than the 58 at RenderSan. Our wonderful guests Pixar's Peter Moxom and Alex Brodie shared their bodacity with everyone. Considering it was around 4200 yen (we pay for our guests plus tax) for a great German style course and all you could drink everyone was happy. The quality of food and beer was superb and the people even better. To be honest I have to organize these things so I couldn't party too hard, after all had gone home Alex, Hiramatsu, Shimamura, and myself had a right booze up over at the British Pub "What the Dickens". I probably talked a load of wobble but it was my hour for enjoyment. PS. ( @HiraTomo )Tomo san yes nobody Poken'ed with us mate! I was all in for some unprotected Poken sharing, maybe next time we can convert these heathens! Ok you may know I am a (li)nux nut, love to build with GNU etc etc.. and how I am always complaining about having to build for Microsloth. Life is getting easier for me because now there is QT on windows. Well actually its been around for a couple of years but only recently I have had the pleasure of getting other companies involved in this QT mania. I have been building QT on *nix boxes for ages and because I am not a Winblows man I thought I would share some of my pain for you other folk. I'm going to be building for Visual Studio 2005 which it's not supported, but hey that's never stopped me. 1.go to the QT repository and get the source you want. 4a. (optional) Now if you run nmake using only a release build like I explain below it's gonna take about 2 hours to compile on a core2 duo! - actually it took mine 2 hours 4 mins with these standard settings. If you are like me and used to GNU goodness like -q (taking use of multicore) then you are going to want to make this extra tweak. oh and yes this DOES work on VS 2005 I know its not documented until VS 2008 but trust me both cores will run! One drawback is its not as parallel as GNU so using both cores wont get you double the speedup, I got a %23 deduction in build time using 2 cores instead of 1. So from 128 mins to 99 mins. I did try the -MP2 (MP) as stated in Visual Studio 2008 docs however no speedup was gained, using the -MP flag alone the system is supposed to get the number of procs automatically. "WARNING: Could not parse Compiler option: -MP, added as AdditionalOption." qmake doesn't seem to recognize the flag but it will obliviously put it in there for you anyway! 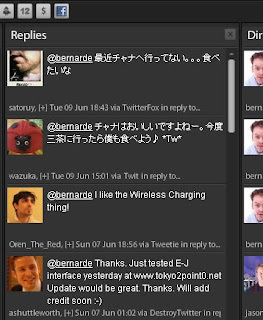 When I first opened tweetdeck I had the same reaction as most WOW. Well it's beta and there are lots of bugs, one of them is its international font unfriendly when first installed. Let me explain, when first opened woo nice hey? 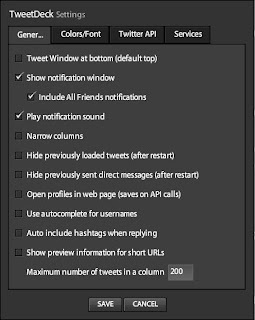 Then click on the Colors/Fonts tab. 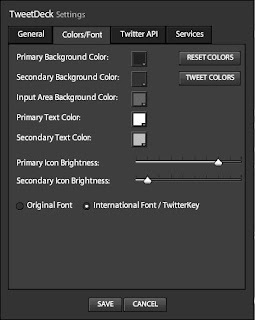 Now check "International fonts" and close the popup. Haven't tried it on mac but I am sure any Unicode base OS wont have the same prob. 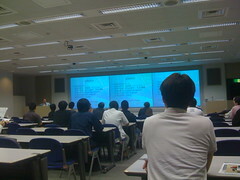 I opened the seminar at or favorite venue Silicon Graphics hall in Ebisu. Officially released our new site http://www.rendersan.org. Had a little rant about how Pixar's RenderMan in particular has been the most if not only stable platform in my career. The PowerPoint I had prepared an hour earlier was a little rough but I think everyone got my idea of how RenderMan is not just a cash ROI but a training one as well. Finished the talk with some woo factor showing my original MacRenderMan / Showplace / Typestry etc. floppies and original order forms from what seems eons ago. 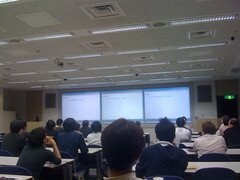 Katsuaki Hiramitsu San followed up with his shading language 101 talk. Coding everything from scratch showing the "bare bones" of RSL and RIB. For most of the people at the meeting seeing RSL coded live was a first. I later asked some of the more experienced RSL people what they thought and said it was refreshing to see a simple scene develop all written in Notepad. Our special guest speaker Pixar's Peter Moxom then gave his virtual tour of Pixar with an excellent real time translation done by my good friend Akira Sugiyama. Lots of great anecdotes and slides which satisfied all the Pixar maniacs in our audience which by the way numbered 58. Peter showed some clips from Pixar's UPcoming "Up" and explained a couple of RenderMan statistics about the film. He finished with some info about new releases. 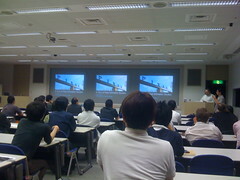 Lastly a special talk was given by Silicon Graphics Japan about their latest hardware. I must give a special thanks to Silicon Graphics Japan for their support for our community. I hope to give a special report on some RenderMan and Silicon Graphics Japan combination's in the future. Just heard from J Tame his Korean Fiend got put in jail for a day for not carrying a passport or foreigners card. The fellow was apparently was asking for directions whilst on holiday here, not something you would expect a spy or illegal alien to do. This happens a lot when low level wankers are given too much power. I also heard they just passed a bill here a couple of days ago, an on the spot fine to us for 200000 yen with no card!! Up till now they would warn or walk you back to your place to get the card - in 20 years I have had this done to me a couple of times. Another thing they like to do is like to stop foreigners here and ask if you have any suspicious items on you. When I get stopped - note I always have had a slightly nutter look about me. I usually like to use a bit of sarcasm saying "sorry officer I forgot to bring my stash today" smile and gladly offer to pull my pants down for a sack search. The funny thing is if I were a spy, dealer or arms carrier I wouldn't be asking for directions, or the like. Dealers and spies please note: in Japan wear a tie look serious and don't ask for directions - all will be fine then. Just goes to show not only are these kind of officers wankers but dumb wankers also. Had a wonderful dinner over at Shirogumi's wonderful studio, all prepared by their staff. We had chat an drinkies till morning. I can't believe how kind they were to prepare everything. Even more amazing was in the wee hours of the morning I went straight back to my office and after an hour's sleep wrote a RenderMan DSO that's bloody brilliant.